I love cake stands, but I always play it safe and purchase them in white. 95% of the time white suits my needs perfectly, but this time of year it just doesn't cute it. Because of Halloween I had to at least have one black cake stand and to be honest I would love one in orange too, but because they are usually pricey, I can't justify an orange cake stand that would only be used once a year. That is where DIY cake stands come into play! 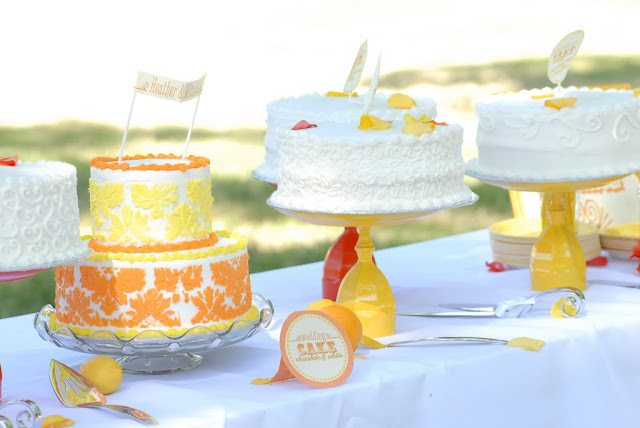 Making DIY cake stands out of candle sticks and plates isn't new, but I love the twist Jenni of A Well Crafted Party put on the DIY cake plate by using goblets. Not only are they fun shapes, but they are great colors too. And because they are inexpensive, you don't have to feel guilty going with a color you might only want to use once. You can check out Jenni's DIY goblet cake stand tutorial over at Eat Drink Pretty.